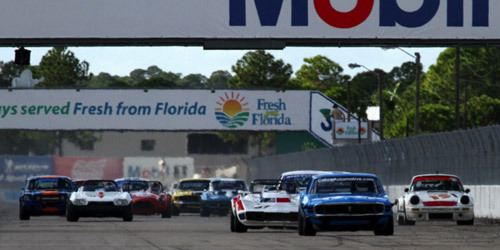 The 2014 vintage racing season was bookended by races held at historic Sebring International Raceway. 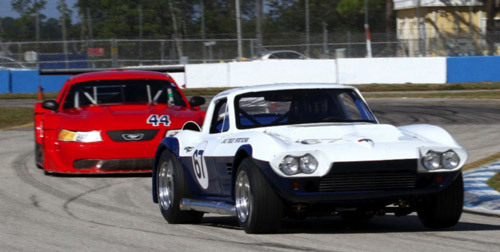 Duntov Motor Company won the opening round; the SVRA inaugural event in March. In December, Duntov customer and friend Clair Schwendeman took care of business in the season finale with a convincing win against a strong field. 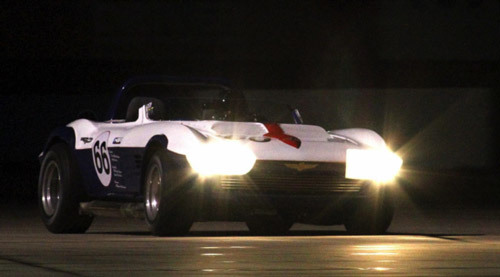 Along with Clair’s familiar red, white and blue 68 Corvette, Duntov brought two FIA Grand Sports for customers Walo Bertschinger and Chicago based sports car dealer, Rick Mancuso. It was Walo’s second race in his serial number 006 roadster, and it was to be Rick’s initial run in his matching serial number 007 coupe. Unfortunately, a last minute meeting called by Ferrari caused Rick to cancel his Sebring travel plans at the very last minute. Walo planned on running every possible session scheduled for his car, which included Thursday test day, three sprint races, a one-hour endurance race, a night endurance race and Sunday’s four-hour endurance race. In total, Walo planned to run 9 hours on the rough Sebring track, and he almost made it! 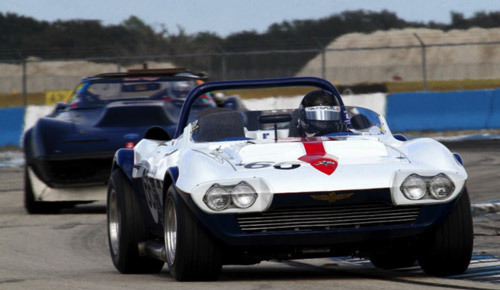 3 Duntov Grand Sports were in the field at Sebring. That last happened in 1964! Thursday test day went without incident. Alan took Rick’s car out in the second session and turned the fastest time of the day up to that point. It was the car’s first competitive run, and the car was almost perfect. As Walo learned the track, he brought his times down several seconds every session. It only took one session to figure out that Mancuso’s 007 was wicked fast! In the qualifying race, Clair followed Curt Vogt the whole race, finally challenging between the last corner and the checkered flag. He came up .034 seconds short! That set the starting order for the rest of the weekend; Curt and Clair side by side on the front row. The International American Challenge race saw Clair follow Curt’s Mustang for half the race, and then pass for the lead. Unfortunately Gatesby Jones in a Porsche passed Clair for the overall lead on the last lap. 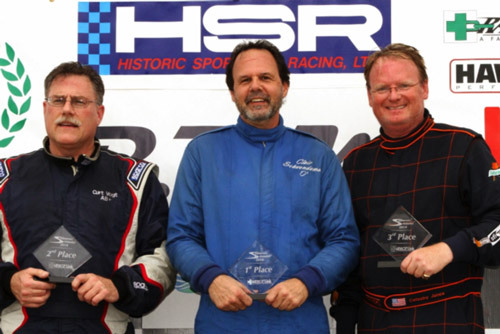 Since Clair finished first amongst American cars, he had the top step on the podium. Funny thing about the Porsches in HSR: they are now allowed to run 16 inch wheels and radial tires. On the International podium, Gatesby mentioned that his tires were two races old! It takes three sets of the bias ply tires that we have to run to make one race weekend. A set will not last 8 laps at 100%. In HSR, the Porsche game plan is to cruise around and wait for our tires to go away, and then make their move. In the feature race, Jones waited too long. Clair again followed Curt through lap three, then passed for the lead and opened it up to almost 4 seconds at the end. Jones struggled to get past Curt, but had to settle for third. Walo finished 8th, with a fast lap of 2:23. For his second race ever and his first race at Sebring; Walo was very quick. The enduros didn’t go as well as we had hoped. During the night enduro Walo suffered a transmission failure. He finished 16th overall and second in class in the one hour enduro, but again DNF’ed in the four hour enduro with an engine noise. Clair and Curt end season with a 1- 2 finish. Chevy first, Ford second. Period correct! Overall, Clair shook off his Sebring jinx in a big way, Mancuso’s car proved to be competitive right out of the box and Walo got his first Sebring race under his belt. 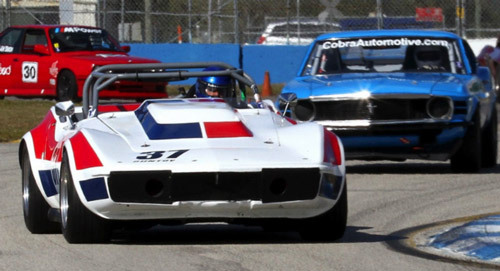 After the opener at Road Atlanta in late February, the 2015 SVRA season gets underway big time back at Sebring the very next weekend. Duntov will bring five cars, including one each for Clair and Walo.